We have come a long way from the mountain of Transfiguration. Last week, Jesus stood on the mountain with Peter, James and John, and was changed into dazzling white. Moses and Elijah showed up and God spoke to all gathered there. Yet, by Wednesday, we had come down from that mountain, and we were faced with our own sin, our brokenness and our mortality on Ash Wednesday. And as we begin Lent, Jesus is tossed into the wilderness. This pattern of Transfiguration to Ashes to Wilderness is one that we repeat each year as we move from the season after Epiphany into Lent. On the first Sunday of Lent of each year we hear the story of Jesus’ temptation in the wilderness, which sets the tone for our Lenten journey. The story of Jesus’ temptation represents both the beginning of Jesus’ earthly ministry, but also is the first step of Jesus’ path to the cross. No stones to bread. No power over all the kingdoms of the earth. No jumping off the temple. In fact, Jesus is in the wilderness for 40 days, tempted by Satan, but also hanging out with the wild beasts and being waited on by Angels. Where is the fasting and praying? Where is the stoic resolve? Where is our example of resisting temptation? Mark’s version sounds almost like a spa vacation. However, Mark remembers something that we have largely forgotten over time. The wilderness is not the place of trial and tribulation that we imagine. In fact, before Jesus arrived on the scene, the wilderness was actually the place where God met God’s people. God sent Abraham into the wilderness with the promise of land and descendants. Moses and the Israelites wandered the wilderness for 40 years, while God provided water from the gushing rock, and manna and quail to eat. Elijah was sent out as young man to save the people of Israel, and along the way God provided water at the stream and food delivered by wild ravens. While the wilderness was a place fraught with danger, it was the place where God’s people met their God. God always showed up in the wilderness, and God’s people were not left to suffer alone. When we imagine wilderness, we don’t usually think of it in these terms. We think of wilderness as the times and places, the experiences in our lives when God seemed absent. The times of illness or suffering, the times of workplace strife or family conflict. The times of addiction and doubt, of grief and depression. And yet, wilderness is no such thing. Wilderness is where God meets God’s people, while all these other things are simply part of the experiences of human life. They are part of the baggage we carry everyday. Wilderness, as we hear about it in Mark’s gospel today, is the place where we go to leave our baggage, our troubles behind. Wilderness is where we are stripped of our burdens and our comforts, where day-to-day living, joys and sorrows, are left behind. Wilderness is where God takes us when we need to be renewed and refreshed, where we can let go and be cared for by God. When the spirit tosses Jesus into the wilderness, it is not really about temptation like we usually hear with this story. In fact, the wilderness is the place where God goes to meet God’s people. And as Jesus waits in the wilderness with Satan, the wild beasts and the angels, there is something, or someone one curiously missing. Jesus goes out to the wilderness, God goes out to the wilderness, just as God has always done and God waits. God waits for God’s people, and we don’t come. It is just the wild beasts and angels. And if there is any temptation on Satan’s part, perhaps it is tempting God to keep waiting and waiting for us. And just has God has always been, God waits for us in the wilderness. God waits the obligatory 40 days, long enough to be sure we aren’t coming. And when God’s people don’t show up, Jesus does something new. Jesus breaks the pattern, God recognizes that waiting for us to come out to the wilderness isn’t working. We just can’t drop our baggage, we just can’t let go of life in order to find God. The wilderness is where God meets God’s people, and when the people won’t come to the wilderness, God brings the wilderness to us. This is what our Lenten journey is about. God coming to us, bringing the wilderness to us. God’s coming and stripping us of our burdens, of our obligations, of our suffering and shame, of our self-centred focus. And God comes to meet us in whatever dark places we are in, whatever dusty, ashy places we exist in. Jesus comes into our lives and delivers an ashy Lenten promise. Jesus promises that wherever we are, whoever we are, whatever we do, the Kingdom of God’s love is near to us, and that God’s enduring love will find us as we head toward death and resurrection. Towards crosses and empty tombs. From the first step of Lent, all the way to Easter. This morning a blogger and writer that I like to read and whom I respect, David R Henson, posted an insightful blog post about the problems with #AshTag. As I prepare for Ash Wednesday, my own thoughts have been swirling around how to approach and understand this first day of Lent. As David considered the problem of Ash Wednesday selfies posted to social media using the hashtag #AshTag, one line in particular caught my attention. Needless to say, I won’t be posting an Ash Wednesday selfie (one would think that Shrove Tuesday or Mardi Gras would be the big selfie night). 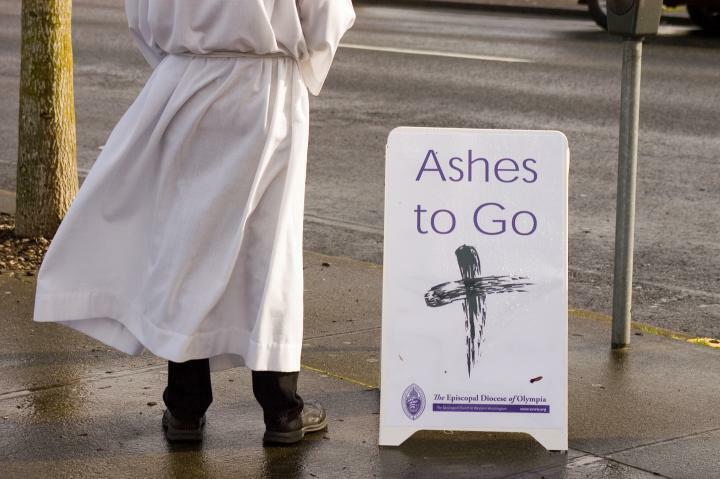 But another Ash Wednesday innovation that I have surprised myself by not being terribly interested in is ‘Ashes to Go.’ Ashes to go is where clergy go out to street corners and subway platforms to offer ashes to those passing by. Often clergy do this in full vestments. I am all for getting out in the world. I totally agree that churches need to look beyond themselves for ways to connect with the world around them (see my last post). And I would never claim that the intentions behind these two practices(?) are not well-intentioned. Nor would I say that Ashes to Go, in particular, doesn’t produce some amazingly powerful encounters between clergy and folks about town. But there is just something missing for me. For me, Ash Wednesday has a deeper context. This year, I will put ashes on my own infant son’s forehead and speak those words. And over the past 6 years of ministry, I have scattered ashes and sand on many caskets. I have uttered the words “earth to earth, ashes to ashes, dust to dust” over the bodies of those who have died of painful, fast-acting cancer, over murder victims, over those who have taken their own life, over children, over those who have suffered for years with diseases like Parkinson’s or MS. The ashes are real in these moments, they aren’t just symbolic. For me, the ashes are not to be taken lightly. For me, the ashes are a reminder of my own tenuous mortality. For me, the ashes cannot be separated from confession, from Gospel, from Eucharist. For me, the ashes are not mine to give, but it is the church’s job, our job to receive them. This is not to say that I would refuse anyone ashes tomorrow night. I wouldn’t. But Ash Wednesday is the church’s chance to confess, to admit our failures, to declare that we are dead, that our bodies, blood, sweat and tears – that even our buildings and budgets – will all be ash one day. And I cannot deliver that message in 30 seconds on a street corner. Perhaps, I could stand on a street corner in full vestments make confession to strangers and ask passersby to put ashes on my forehead. Maybe ‘Ashes to Go’ would make sense to me then. But more importantly, I can’t leave Ash Wednesday at the ashes. I can’t just stop at the part where I am dead. I have to hear the Good News. I have to hear that God makes me alive. That God makes us alive. And as a preacher, I need to preach that news too. I need to invite the Ashen Assembly to the table of the Lord, to receive the bread and wine that makes our dry bones and ashes come to life. 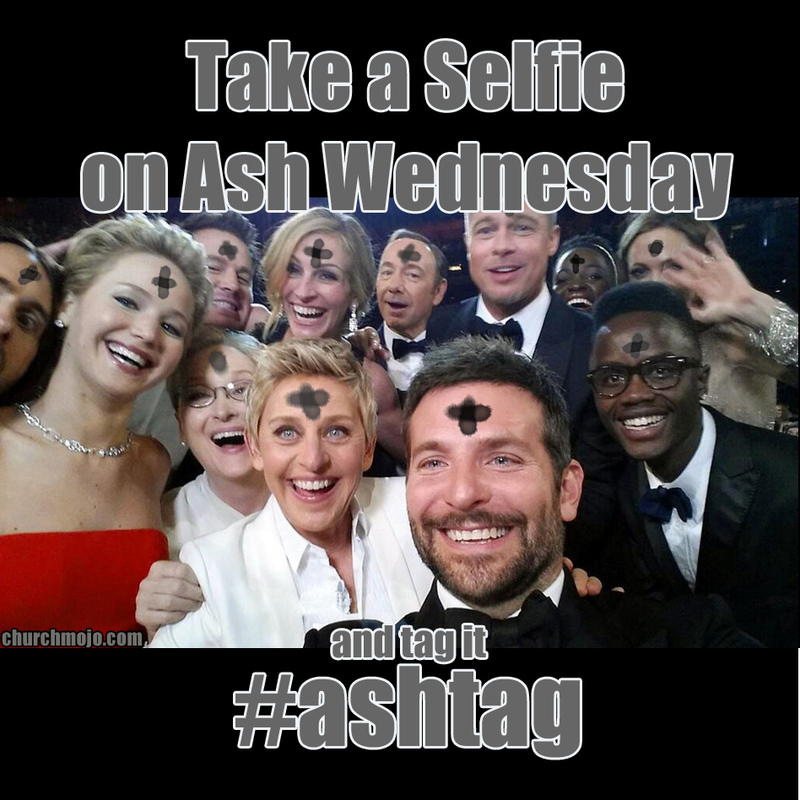 To me, smiling goofily into my smart phone for an #AshTag selfie, or standing on a street corner in my vestments handing out fast food ashes has missed an important part of Ash Wednesday. The reality that we are really dead, like body-in-a-casket-being-lowered-into-a-grave dead. And the reality that only God can make us alive. The thing is, we need Ash Wednesday, all of it. And the ashes aren’t really the point. 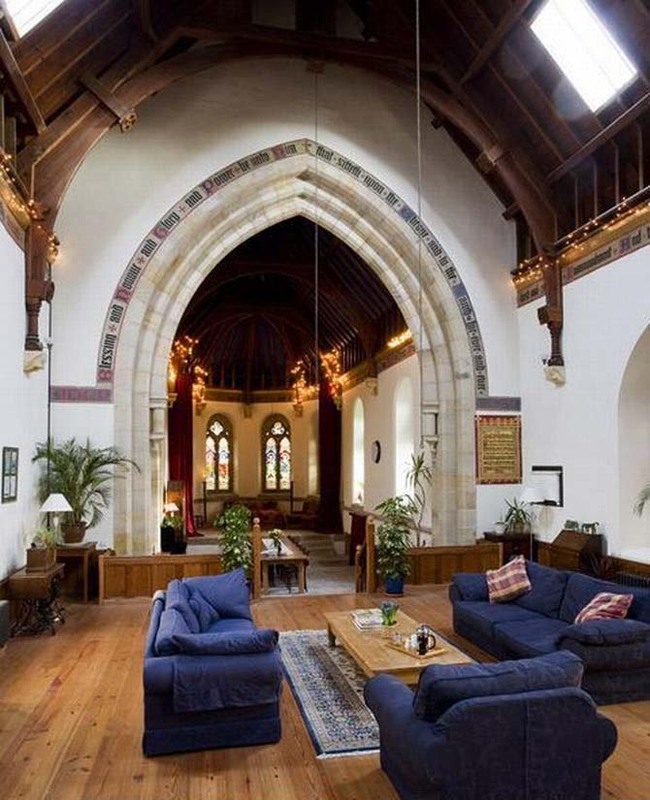 When I talk to colleagues and church members it doesn’t take long to hear stories of congregations and churches fighting over the details of ministry: the style of worship, the number of staff to hire, the colour of the carpet, the need to have a Sunday School (even in churches with few or no kids). As I was writing my sermon for last Sunday, it occurred to me that a ministry focused on making people comfortable and happy is doomed. In fact, it sounds eerily like palliative care. The amount of palliative care ministry that many congregations are doing is incredible. Now to be clear, true palliative care for those facing the end of life, particularly with illness is very important work – holy work even. However, when the regular ministry of the church starts to look like the holy work of making people comfortable as they face the end of life, we have a problem. 1. Trying to keep everyone happy. Hospitals generally try to treat illnesses and make people better. Schools try to teach and form students. But the only institution that I can think of, whose chief goal is keeping people comfortable, is a hospice or palliative care institution. Churches and Pastors whose primary aim is keeping people happy are basically doing palliative care. 2. Focusing exclusively on people already here. Churches have become really good at focusing on insiders. Churches worry about what their members will think about new initiatives or programs. They are concerned about losing even a single discontent member and are constantly searching for any hint of displeasure among the rank and file. Churches like this worry about new people showing up and upsetting the established, delicate balance. Palliative care is about focusing on those in the program, not about seeking new patients. 3. Avoiding conflict at all costs. When there is only a limited amount of time left, why ruin it by fighting? Avoiding conflict is rooted in the hopes that problems will just go away if we ignore them. And the reality ism in palliative care most problems do just go away eventually – you know, that whole death thing. Death is a great problem solver. When churches simply brush conflict under the carpet, they are hoping it will just go away. And yet, the only way conflict goes away in churches is if all those involved die… and even then it can linger. 5. Everything becomes about preference. Churches worry a lot of about people liking things. We fight over getting our own way when it comes to worship, programs, facilities, planning. How we worship, the bibles we read, the food we eat, the chairs we sit in, the paint colour on the wall all becomes a matter of preference. Pastors and leadership can start to worry whether they have provided the right mix of preferences for members. We become like a nurse asking if a patient wants more pillows or blankets, chicken or beef for dinner. 6. We talk a lot about decline and dying. Maybe the biggest resemblance to palliative care is when churches begin talking a lot about decline and dying. Now, I am not saying we should avoid identifying trends and history. But unlike someone with a terminal illness, it takes a certain amount of hubris (conscious or unconscious) to think we are finally the ones who will kill all our churches. But more importantly, churches are not terminal patients. Imagine someone who gets to a certain age, starts getting a few grey hairs or wrinkles, maybe has some aches and pains, and then starts talking all the time about dying imminently. It seems absurd. Because it is absurd. Yet this is what so many churches are doing whenever they meet to discuss and plan their future. As I said before, true palliative care and palliative care institutions do important work. They provide care and dignity to people who are facing their last days. Please don’t take what I am saying to be a condemnation of that work, but rather a lens through which to see how we as pastors, leaders and church folk are approaching ministry. When our ministry as churches and congregations takes on the character of palliative care, we have lost the plot. We become insular groups of people, looking after our own and worst of all, waiting to die (even if we don’t know it). But the thing is, God doesn’t do palliative care. As far as I can remember, Jesus never helps people die in the gospels. God is about Life. New Life. Abundant life. Life where there should only be death. God doesn’t make us comfortable as we die. God makes us uncomfortable so that we can live. Stop talking about how we are dying all the time. Or at least recognize that our dying is only a part of God’s alive making. Turn our focuses outward, stop worrying so much about people who are in the pews already and think about ministry to those who are not in the pews… yet. Conversation. Dialogue. Talking. Communicating. We need to talk less about the things we like or don’t like about church (maybe forget talking about them at all), and begin talking about what ministry is happening. Talk about what God is doing in our lives and in our communities. Do the hard work of living as a community, instead of dying. Living is uncomfortable, it is conflictual, it makes some unhappy at times, and requires us to live with uncertainty about what is coming next. Ministry that looks like palliative care is killing us. Or least it us letting us as pastors, churches, and Christian hasten our journey towards communal, institutional death. And worst/best thing is, we aren’t terminal. …When they found him, they said to him, “Everyone is searching for you.” He answered, “Let us go on to the neighbouring towns, so that I may proclaim the message there also; for that is what I came out to do.” … (Read the whole passage here). For the past 3 weeks, we have been setting the stage with Mark’s gospel. Setting the stage for what starts next week. Next week Jesus will go up the mountain of Transfiguration, with Peter, James and John. He will change before their eyes into dazzling white and God will instruct the disciples to listen to him. And then Jesus will go down into the valley of Lent, down into the wilderness of temptation, down the road to Jerusalem and his journey won’t end until he heads up that second mountain, the mountain of Golgotha, the mountain that ends in a cross. But today we are still laying the ground work. Jesus has been preaching in synagogues, exorcizing demons and today we glimpse Jesus’ healing ministry. Jesus leaves the synagogue of Capernaum and goes to the house of Simon Peter and Andrew. There Simon’s month-in-law is sick and in a bed. Jesus takes pity on the poor woman and heals her… and in an almost comical moment, she gets up and starts serving her guests. And then everything gets crazy. The whole town hears that Jesus the healer is there, and they all come clamouring for healing. Everyone with a cough or cold, with a limp or back pain, with short sightedness or epileptic seizures, they are all hoping to have their illnesses cured. Jesus starts the work of helping the needy masses, and yet we get the sense that this is not what Jesus is interested in. He isn’t playing doctor happily, and by early morning, he sneaks away to get some quiet and space. Jesus must have been wondering where all these people were when he was preaching in the synagogue. And this is the dilemma that Jesus faces all the way through Mark’s gospel, the problem that Jesus faces all the way to the cross. When Jesus is healing people and exorcizing demons, the crowds flock to see him. But when he preaches the Kingdom of God coming near, people get upset. The authorities feel threatened. When Jesus brings his message to the people, the people get uncomfortable and begin to turn on him. They like it when they are getting something from Jesus, but when Jesus proclaims and declares change and transformation on their end, they back away and get upset. It is all well and good to be healed of a chronic condition, but suggest that the way the world works might change and people get antsy. As Jesus spends the night healing in frustration, we can see a problem that still exists among people of faith today. God is easy to for us to seek out when we need something. When we need help, healing, comfort, God seems like an easy ask. When are in trouble, or have problems for which there seems to be no easy solution, we turn to God with relative ease. As people of faith, it is all too easy for the ways we experience God to become about us. God becomes something we expect to be doing something for us. When life throws us those curve balls we turn to God to heal our hurts and pains, to solve our broken relationships and strained families. But even in our day to day, week to week, Sunday to Sunday relationship with God we can start to expect God to be doing something for us. We like to experience God on our terms. As people in the pews our terms might include the right music, entertaining sermons, 60 minute services, comforting bible readings and prayers, cushy seats. As pastors we like to deliver God on our terms, with liturgies planned to our liking, in bible texts that make the points we like to make, in prayers and hymns chosen to fit our themes. When we don’t stop to think about it, it is easy to fall into the pattern of expecting that God is all about satisfying us, that we come to God waiting to be filled up, entertained, healed, set right and made comfortable. Let us go on to the neighbouring towns, so that I may proclaim the message there also; for that is what I came out to do. That is what I came out to do. Not to spend his time healing and exorcizing demons. But preaching the message. Jesus has come to preach the message that Kingdom of God has come near, and that is not what the people are clamouring for. The people want their problems solved, they want comfort and healing, the want to be free from demons and evil spirits, they want things to go back to normal, things to be easy, things to be better. And what is the matter with Jesus? Why couldn’t he just stay a couple extra days, or a week and heal everyone? Is that to much to ask? The issue that we discover today is this convergence of what the people want and what Jesus has come to do. The people want their symptoms treated, and Jesus wants to address the root of the problem. It is far too easy for us to make God and faith and church about us. It is easy for us to come to God clamouring for healing and comfort, clamouring for God to approve of us and our ways of being in the world. And that is not to say that Jesus is not the great healer, or that God doesn’t love us deeply just as we are. But God has bigger plans for us than comfortable pews and our favourite music. Jesus does so much more than make our fevers go away, or relieve us of our back pain. And Jesus’ message cuts right to root of our issues. Jesus has come to deal with the source of our hurts and pains, of our griefs and sorrows. Jesus has come to address the reasons we put ourselves first, others second and God last. Jesus has come to deal with sin and death. To deal with our sin, with our death. Jesus came come to meet sin and death by coming near. By coming near and joining with us in our sin, by taking on our death. And Jesus comes near to show us that sin and death are not the end. We are not here to be on palliative care, to only be comforted and relieved of our pain. Because that is what relieving us of our hurts and pains is. Because that is what comfortable faith is. Palliative care. But Jesus has come to do the hard work of saving us. Saving us from ourselves, our self-centred, self-interested, deathly ways. And that is what Jesus has come to do. That is what Jesus is doing. What have you to do with us Jesus? Today, we pick up in Mark’s gospel where we left off last week. Jesus has preached his first sermon, “The Kingdom of God has come near” and called Simon and Andrew, James and John to be disciples. Now the group of them head to Capernaum, which becomes the home-base for Jesus’ ministry. It is the Sabbath, the day of worship, and they go to the synagogue. Jesus begins teaching, as was the right of any circumcised Jewish man. Usually, it was local scribes or rabbis who preached but sometimes travelling preachers like Jesus would come by to teach. As Jesus begins, the congregation notices something different. Jesus is not teaching like the scribes. The scribes who were like walking encyclopedias of religious knowledge. The scribes were experts in the law, in the teachings and interpretations of the Jewish faith. The scribes didn’t innovate or interpret, they simply memorized what had been interpreted and written down by rabbis and other authorities long ago. New teaching was dangerous and probably heretical. It was important to stick to what they knew to be tried and true. Yet, Jesus was preaching something new. Something different. Jesus was preaching from his own authority. Preaching like he had some special access to Moses, Elijah and the other prophets. Like he had special access to God. While most people weren’t sure what to make of this Jesus guy, who he was or where his authority came from, one person did. Or rather an unclean spirit did. While regular humans don’t see who Jesus really is, the supernatural unclean spirit knows. And the spirit knows that Jesus is a threat to the established order. The spirit knows that Jesus has come to turn things upside down. The spirit knows the world that he and the people around him are stuck in is the past. The comfortable systems, traditions and ways of being that they are used to are over. Jesus is going wreck things. The spirit is the one who speaks. The man with a spirit might just be a man with an unclean spirit. But for Mark the man might also represent the ways in which that community, that world, was possessed by tradition. Stuck in past. Unable to introduce any change that threatens the status quo. Churches these days often struggle with this issue. We often long for things to be as they once were. We long to have Sunday schools with 100 kids every Sunday, and services that are standing room only. We long for offering plates to beoverflowing, we hope for more baptisms than funerals. We long for the past, or at least the way we remember things to be. How many Lutherans does it take to change a lightbulb? Change!??! That lightbulb was good enough for my grandfather, so it is good enough for us. When the unclean spirit names the threat that Jesus is not only to the good deal that the spirit has possessing some poor man, but also the threat that Jesus represents the whole world of the people of Capernaum and beyond, Jesus will have none of it. Jesus will not be deterred by the anxiety and fears, or the unwillingness of the spirit or people to let go. Jesus is preaching a new world, Jesus is calling the people around him into the future, into a new way of living. Jesus’ new teaching is astonishing, radical, unheard of. And it comes from a place that people don’t understand, but that the unclean spirit gets. The unclean spirit knows that the old ways, that the established approved way of doing things is safe, is comfortable, it is known. The spirit knows that people would so often rather be possessed by trying to maintain the past than face the unknown future. Be Jesus knows that God is calling us into something new and unknown. And Jesus knows that we need to be exorcized of our fears and worries if we are going to see God’s future. Because we are often possessed by maintaining our past, by trying to recreate what we once were. We hold onto the traditions, systems, and ways to doing things that were good for our grandparents and so, we believe, are good enough for us. Now don’t hear Jesus wrongly. Jesus is not saying that the past is wrong or bad. Jesus is not saying that God wasn’t active in the past, or that God wasn’t working through the ways we used to do things. Often when churches and individuals face change, letting go of what we once were is so hard because it feels like we are dishonouring our forebears. It feels like we are saying our parents and grandparents were wrong, that they weren’t being faithful. That is not what Jesus is saying. Jesus knows that God has been present among the people, among us the whole time. Jesus isn’t exorcizing us of our past. Jesus is exorcizing us of our holding on, of our resistance to change, of our need for safety and comfort. Of our fears and anxieties. It is not the past that keeps us from seeing God’s future, it is our efforts to keep things the same, to recreate what once was, what we once were. And Jesus’s new teaching is really about showing us that new world. Showing us God’s future. Showing that God is coming to, meeting us in the future. God knows we cannot go backwards. And that is what is so radical to the people in the synagogue in capernaum, so radical for us today. God is not a God of the past, God is not about keeping things, keeping us the same. God is about resurrection, about turning death and forces that hold us back, into new and abundant life. O God, you have called your servants to ventures of which we cannot see the ending, by paths as yet untrodden, through perils unknown. Give us faith to go out with good courage, not knowing where we go, but only that your hand is leading us and your love supporting us; through Jesus Christ our Lord.